As the eyes of the world focused on the successful rescue of the Chilean miners, I couldn’t stop thinking about an incident many years ago that was probably the first time in the television age that a rescue became the focus of such intense and widespread public attention. It happened in 1949 in San Marino California, just 10 miles from the Los Angeles suburb where I grew up. I would not be born for several years, but during my childhood simply saying the name “Kathy Fiscus” meant that you would hear all the stories and memories of the girl who was trapped underground. 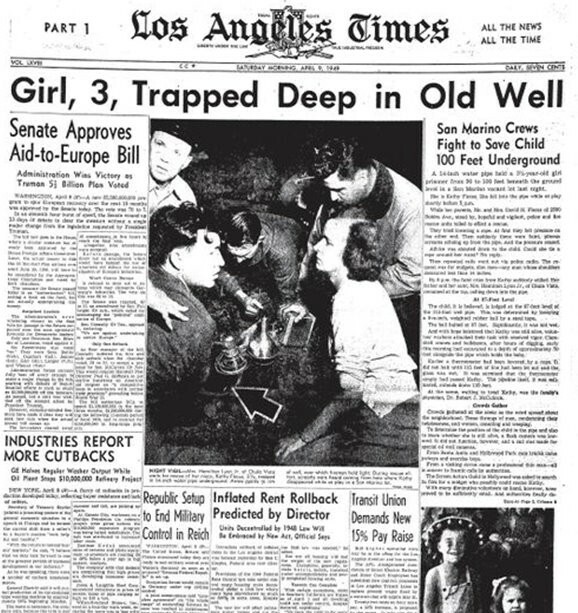 In April 1949, three year-old Kathy was walking across a deserted field in the Los Angeles suburb of San Marino when she fell down a water pipe that was 120 feet deep and 14 inches wide. In what would become a familiar tableau for decades to come, a crowd of reporters, public safety officials, and onlookers focused on the hole while rescuers, aided by heavy equipment and witnessed by a crowd of over 10,000 onlookers, desperately attempted to rescue her. It took two days to reach Kathy, and the entire saga received both local and national news coverage. Perhaps the most memorable reporting was done live from the scene by KTLA’s Stan Chambers. Some media historians see Chambers’s work at the scene as the start of the modern era of television news. In later years, Chambers — as polite and civil a human being as you can imagine — was always willing to discuss the incident with the curious, and wrote a fascinating memoir about being present at the creation of a new medium. Sadly, Kathy did not survive the fall and likely suffocated quickly from a lack of oxygen. 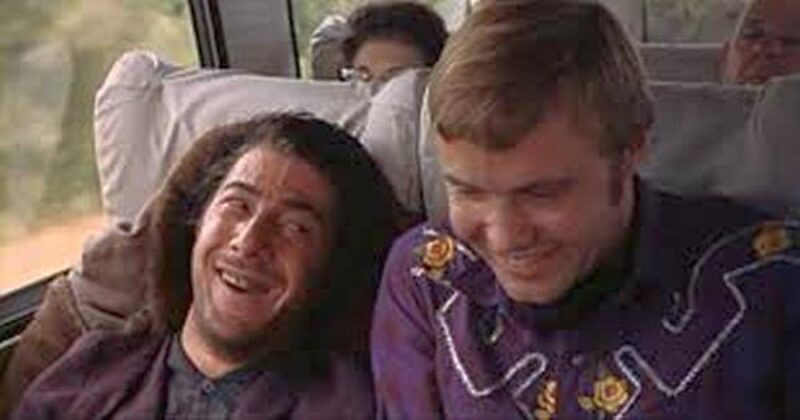 But the incident later became the basis of several books, a film, and even an extended segment in Woody Allen’s film Radio Days. If you have seen Radio Days, you will recall the scene in which a crowd of of radio reporters describe a failed attempt to rescue a young girl named Polly Phelps from an abandoned well. That scene was an adaptation of the real events that occurred in the case of Kathy Fiscus. It may not have been clear at the time, but — after the large television audience focused on the attempt to rescue Kathy — critical incidents of all sorts would increasingly play out in front of television cameras, and be collectively experienced by a public able to watch events unfold in real time. It’s funny. Watching last night as the last Chilean miner was extracted from the mine, I realized that all the technological change in the world has really not altered the fundamental human desire to watch the successful rescue of someone in peril. Fate is cheated, and — for a moment at least — we can delude ourselves into thinking that the tyranny of randomness can sometimes be foiled. Kathy’s life was not saved, but the impact of that shared experience was such that — even today — almost anyone in Southern California of a certain age remembers Stan Chambers at the scene and the bright lights on that deserted field.